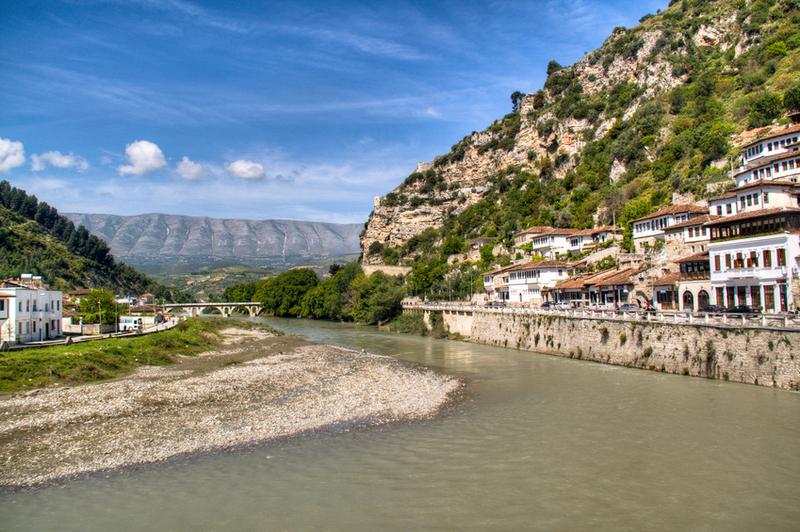 A magical land in deepest Albania, Berat paints a stunning picture. White Ottoman houses spill down the rugged hillside from the castle, earning it the name of “town with a thousand windows” while the old quarters don whitewashed walls, cobblestone streets and tiled roofs. It’s particularly evocative when clouds swirl around the tips of the minarets, breaking up to reveal the icy cap of Mount Tomorri. History dates back to the 3rd century BC when Antipatrea, an Illyrian hilltop fortress, was built here. The Byzantines strengthened the fortifications in the 5th and 6th centuries, followed by the Bulgarians four hundred years later. After a period of general decline in the 18th and 19th centuries, Berat started to develop as a crafts centre specialising in wood carving. Today it draws in the tourists but still manages to charm with its relaxed and friendly atmosphere. Walk through past times in this enchanting neighbourhood tucked inside the castle’s walls. The ancient streets take you to places where people live alongside churches and ruins. In spring and summer, the scent of camomile fills the air while wild flowers burst out from every gap between the stones. The Inner Fortress lies at the highest point, a steep ten minute climb from the centre of town, where crumbling stairs lead to an atmospheric water reservoir. The views are awe-inspiring in all directions – take a guided tour from the entry gate. Head for the Dormition of St Mary which today houses the Onufri Museum dating back to 1797 having been built on the foundations of a 10th century church. The museum showcases Onufri’s spectacular 16th century artworks which are displayed on the ground level, alongside a large screen bearing a collection of beautifully gilded icons. The UNESCO Listed old town (Mangalem quarter) boasts three grand mosques: the 16th century Sultan’s Mosque, one of the oldest in Albania; the big mosque on the town square named Lead Mosque because of the lead coating its spherical dome; and the 19th century Bachelors’ Mosque sitting by the Osumi River – look out for the enchanting paintings on its exterior walls. Interestingly, this mosque was built for junior craftsmen and unmarried shop assistants and was conveniently located between some fine Ottoman-era shops. Below the castle, the Ethnographic Museum is housed in an 18th century Ottoman house. It exhibits an interesting collection of traditional clothes and the tools used by weavers and silversmiths, along with kitchens, guest rooms and bedrooms, decked out in traditional style. Don’t miss the mafil, a mezzanine looking down into the living room, where the women of the house used to keep an eye on the men, just in case their cups needed filling. Losing yourself along the enchanting streets as you wind your way through the town will no doubt mean you will stumble upon a small tavern or two along the way. If you’d like to visit a local vineyard, the Çobo Winery is perhaps the most fascinating as the family has a long tradition of wine making, which was briefly stopped when Communist power forced them to stop. Afterwards, with the advent of democracy, commercial winemaking recommenced. The site consists of several vineyards, the family’s home, a winery and a wine presentation and tasting facilities.